During my 15 years as a full time Realtor in the Charleston, S.C. area, I have had the pleasure to assist many out-of-town buyers moving or considering relocating to "The Lowcountry." Many of these families have visited Charleston over the years or heard of how nice the area is from their friends. Often times, the transfer is job related, with the family having aprehension about the move. Understanding that everyone's situation is different, I try to answer every question you may have about Charleston and the housing options. I provide via e-mail and "hard copy", information about Charleston, the schools, hospitals, shopping, the economy and the opportunities available in the area for families of all ages. In order to get an idea as to some of the out-of-town families I have helped this past year, I thought it helpful to set forth a brief profile of some of my clients. Feel free to contact me with any question.If you are planning on visiting the Charleston area on a house hunting trip or just to look around, I will be glad to introduce you to the area and your different neighborhood and community options. On December 29, 2009, Joe had the pleasure of representing an engineer with Perot Systems & his wife from Weston, Pennsylvania in the purchase of a beautiful home in Rivertowne County Club. The husband provides services to support Boeing operations in the Charleston area. 1. Yarmouth, Maine - Wholesale Company Representative with four children who found the perfect home in Seaside Farms. 2. Peabody, Mass.- Small business owner and teacher with two children who are building a home in Seaside Farms. 3. Perrysburg, Ohio - Earnest & Young "Entrepeneur of The Year" who with his family purchased a waterfront lot on Daniel Island on which to build his retirement home. 4. Chatsworth, Calif. - Writer and Business Owner who purchased a waterfront home in Rivertowne On The Wando. 5. Oak Ridge, Tenn. - Couple who purchased property for investment and as a week-end retreat prior to retirement. 6.Honolulu, Hawaii. - Active Duty Navy couple being transfered to Charleston purchased a home in the Dunes West subdivision. 7.Valrico, Fl.- Active Duty Coast Guard Officer transferred to Charleston purchased a home in Summerville, S.C.
8.Chesapeake, Va.- Well known Medical Doctor who purchased a home in Belle Hall Plantation. 9.Goleta, California - Retiree who will purchase a home in the Longpoint Subdivision.10.England - Helped the Chief of Dental Services, USAF relocate from overseas to the Charleston area. 11. Assisted a young couple from York, Penn. locate a new home in the Park West subdivision.12. Vienna, Va. - Located the perfect home and subdivision for a young couple looking to escape the "hustle" of Washington, D.C.
13. Raleigh, N.C. - Located a great home and home site on which to build a home for a top administrator at Roper Hospital in Charleston. 14. Olney, Md. - Located just the right home to suit the specific needs of a Federal employee and each member of her family. 15. Spotsylvania, Va. - Assisted a professional couple locate a traditional "Charleston style" home in the Low County where they can carry on their consulting business while at the same time enjoy all Charleston has to offer. 16. Glenview Illinois - Helped a "comodities" trader locate the perfect home in a golf course community. 17. Ft. Lauderdale, Fl. - Located "the perfect" waterfront home in a super convienent location for a retired couple who want to be near their children and grandchildren who live in nearby states. 18. McLean, Va. - Was able to find a lovely "first home"in a great neighborhood for a pharmaceutical rep and her law enforcement husband who are relocating to the Charleston area. 19. Doylestown, Ohio - Located the "perfect" water view retirement lot for an Architectural Engineer and his family.Click To Read. 20. London, England - Assisted the "Construction Manager" of the Multi-National Firm that is building the new "Cooper River Bridge" locate a home in Mt. Pleasant. 21. Pine Bush, New York - Located just the right retirment home for a couple who want to be closer to their children as well as escape the harsh New York winters. Charleston after many years of trying to relocate to "The Lowcountry." 24. Located a great second home in Hamlin Plantation for a 49 year old "entrepreneur" from Hampshire, Illinois. 25. Ridgefield, Conn. Helped a "Custom Kitchen Design" Representative locate a primary residence in a golf course community in addition to investment property. 26. Oceanside, California - Represented a retired Marine Corp Officer and his family in locating their dream home in Mt. Pleasant, S.C.
27. Bellview, Nebraska - Found the perfect home for a U.S. Air Force Denist employed at the Charleston Air Force Base. 28. Corpus Cristi, Tx. - Found the perfect floor plan in a new home in Summerville , S.C. for this U.S. Coast Guard Instructor and his family. 29. Rock Hill, S.C. - Represented an executive with Wachovia Bank in his transfer to Charleston, S.C.
30. Park Ridge, Illinois - Assisted the parents of a former client locate a home in a great golf course community in Mt. Pleasant. 31. Manassas, Virginia - Located a new home in Summerville, S.C. for a Nurse at the Charleston VA Hospital. 32. Hawthorne, Calif. - Represented a young couple purchase a golf course lot in Coosaw Creek, A lovely golf course community. 33. MUSC, Charleston - Represented A Clinical Psychologist From MUSC in locating a charming home in Mt. Pleasant, S.C.
34.Sleepy Hollow, New York - Assisted a Financial Analysis In Finding a great home on an acre lot in the Dunes West Golf Course community in Mt. Pleasant. 35. Ft. Wayne, Indiana - Located a lovely home overlooking a picturesque lake in Rivertowne Country Club for a family from the mid west. 36. Devon, England - Helped a retired couple find just the right home overlooking a beautiful lake in a country club community. 37. Morrisville, NC- Represented a certified financial planner and medical researcher in the purchase of a home in a gated golf course community. 38. Long Beach, NY - Helped a couple locate a second home in Mt. Pleasant with the "perfect" backyard and swimming pool. 39. St. James New York - Represented a certified financial planner in locating a new townhome in the Dunes West subdivision. 40. Round Lake, Illinois - Found a great building lot for a developer/builder from Illinois who is relocating his business to the Charleston area. 41.Westfield, Mass. - Represented the new Assistant Commandant of Cadets at The Citadel in the purchase of the families new home in Rivertowne on the Wando. 42. Phoenix, Maryland- Represented a certified financial planner and avid golfer in the purchase of a second home on a golf course lot at Rivertowne Country Club. 43. White Fish Bay, Wisconsin - Provided buyer agency representation to a professional couple, recently retired but pursuing second careers. 44. Located a waterfront home in the town of Mt. Pleasant for a retired Software engineer and attorney from Wellesley, Mass. 45. Represented a retired police detective and his wife from Meriden, Ct. in the purchase of a home in Hamlin Plantation. 46. Represented an insurance executive and his wife from Warren New Jersey in the purchase of a deepwater lot on the Wando River in Rivertowne on the Wando. The couple are currently in the process of developing preliminary building plans for their vacation home. 47. Along with my business partner, who specializes in Charleston Historic District real estate, represented a business executive from Riviera Beach Florida in the purchase of 53 Tradd Street, a 3850 sqft. 3 story Charleston Single home built in 1735. The home was owned by George Saxby, lnspector of Stamp Duties during the Stamp Act crisis of 1765. 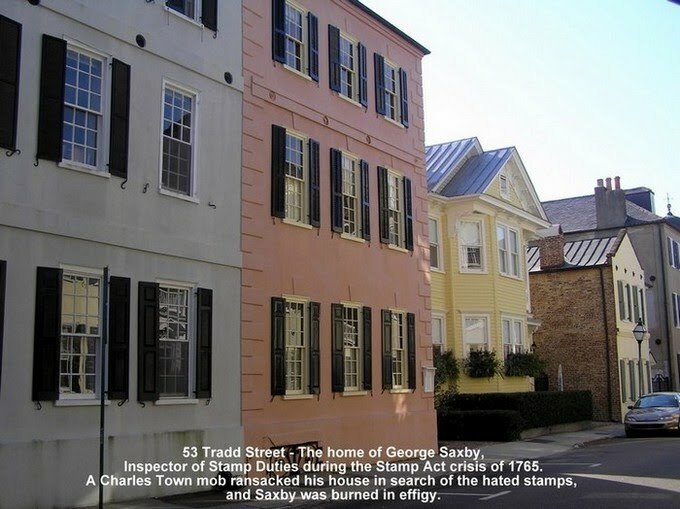 A Charles Town mob ransacked his house in search of the hated stamps, and Saxby was burned in effigy. As you can see from the profile of my clients, they come from throughout the United States and World with different backgrounds and needs. They have relied upon my knowledge of the area and dedication to my clients to find them a home in the area for the right price.